Posted On Tue, 04 Apr 2006 20:06:00 +0000. Filed in rockclimbing. By Vaibhav Bhandari. Rappelling Originally uploaded by vbha. Star Chek and Climbing in Squamish~! 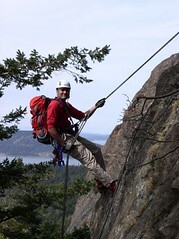 Lead on traditional rock climbing routes - woho!